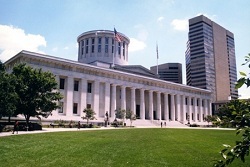 Each year BioOhio invites Ohio lawmakers to join us and our members at the Statehouse for an opportunity to discuss the impact and importance of Ohio’s bioscience companies, research institutions, and educators. The event features networking and lunch in the beautiful Statehouse Atrium, as well as individual meetings with legislators throughout the day. Read personal perspectives from members that attended Statehouse Day here. BioOhio would like to thank our national partner, AdvaMed, for their support of this event. BioOhio takes this opportunity to recognize lawmakers that have shown particularly strong support of our industry, through introduction of bills, support of policies, and creation of initiatives that benefit growth of bioscience in Ohio. This year BioOhio presented awards to Senator Bill Beagle and Representative Andrew Brenner. Senator Beagle is a strong proponent of BioOhio and Ohio’s bioscience industry, including support of Ohio Third Frontier, Thomas Edison Center funding, various workforce issues and has taken time to visit many Ohio bioscience companies within his district and beyond. Representative Brenner has been a strong supporter of repealing the Medical Device Tax, including sponsorship of an Ohio House resolution to repeal the tax that is currently putting great strain on medtech companies across the country. John F. Lewis, Jr., President and CEO, BioOhio. John, a 4th generation Ohioan, is an outspoken advocate for industry led, market facing academic/industry collaborations. He is a licensed attorney with experience in international business, venture capital investments and economic development. Mark Bode, CEO, Director, Founder, Joey Medical. Mark previously served as CFO and COO at two start-up companies where he raised $24M. Mark has worked for over 20 of years in technology venture capital and investment banking. Prior to Cincinnati, he has lived and worked in New York, San Francisco, Palm Beach and Chicago. He has completed over 70 transactions totaling $3.2B. Mark received a BA from Swarthmore College and an MBA in Finance with Honors from the University of Chicago Booth School of Business. Tom Tremble, Vice President, Sate Government Relations and Regional Affairs, AdvaMed. Tom is responsible for the association’s state government relations in the Eastern United States and Puerto Rico and liaison with state and regional device groups. Tom played a key role in developing and implementing AdvaMed’s State Competitiveness Agenda, a compendium of policies for state governments to adopt to provide a positive climate for medical technology providers to grow. Gordon Rosenberry, Director, State Government Affairs (IN, OH, KY), Johnson & Johnson. Gordon represents PhRMA as the State Government Task Force Chair in Ohio. Previously, Gordon was a Senior Manager of Government Affairs for Schering-Plough and a Senior Hospital Representative and State Government Affairs Manager at Zeneca Pharmaceuticals. He has extensive experience in dealing with Medicaid Formulary, healthcare reform and various legislative issues. If you would like to attend this event, but are not currently a member, visit our membership page for details on how to join. This is only one of the many benefits of being a BioOhio Member, we’re certain you’ll enjoy joining our community! Visit the Advocacy section of our website to learn more about issues in the industry. We’ve also posted a number of helpful links to identify your local representatives.